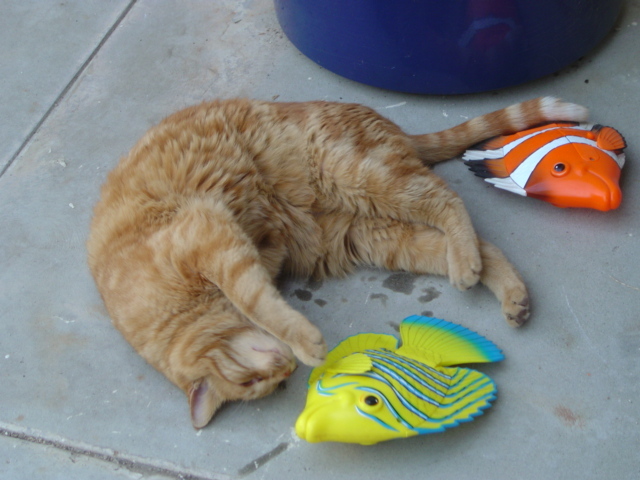 I mentioned in a previous post that Kivuli like olives…well, he also likes fish, but not for dinner…for nap time. Yes, you read that correctly – NAP TIME! Let me introduce you to Kivuli’s Fish! We had a nice big pool when we lived in Palm Springs. One day I saw these fish in a store. They are battery operated and swim under water around and around the pool. I thought they would be neat to have swimming around in the pool from time to time. So I bought the fish. 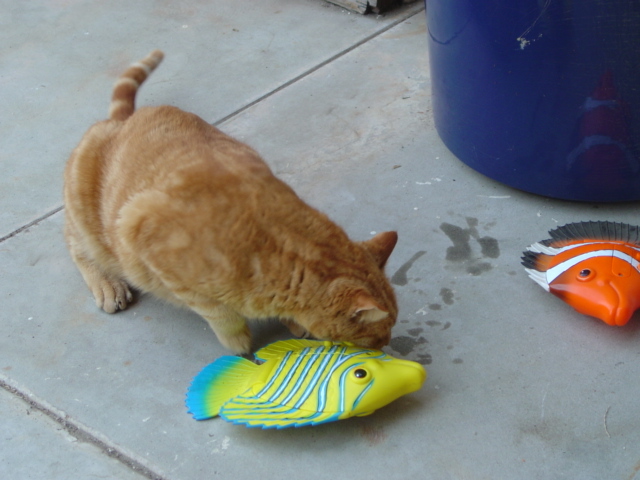 When we would pull the fish out of the pool we would lay them on the cement to dry out a bit before putting them away. 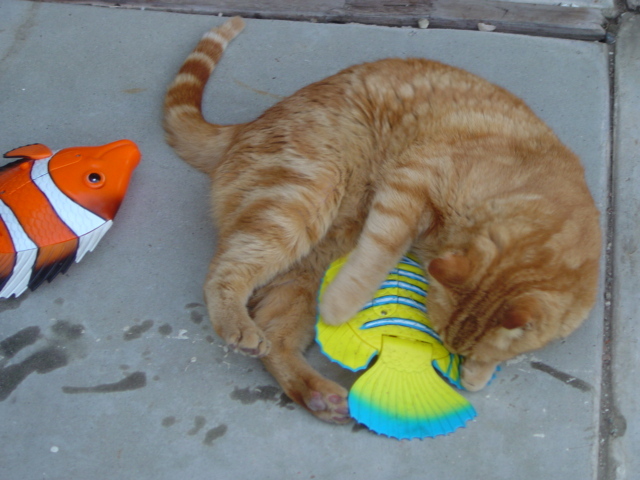 One evening we found Kivuli rubbing and rolling all over the fish. Kind of like the olives, there must be some scent on them that he likes. When we bought the house in Texas there was an above ground pool in the back yard. So when I was packing up things in Palm Springs, I decided that Kivuli’s fish needed to come with us. After living here a few months we decided to get rid of the pool and put in a vegetable garden. Kivuli’s fish ended up on one of the shelves in the garage. 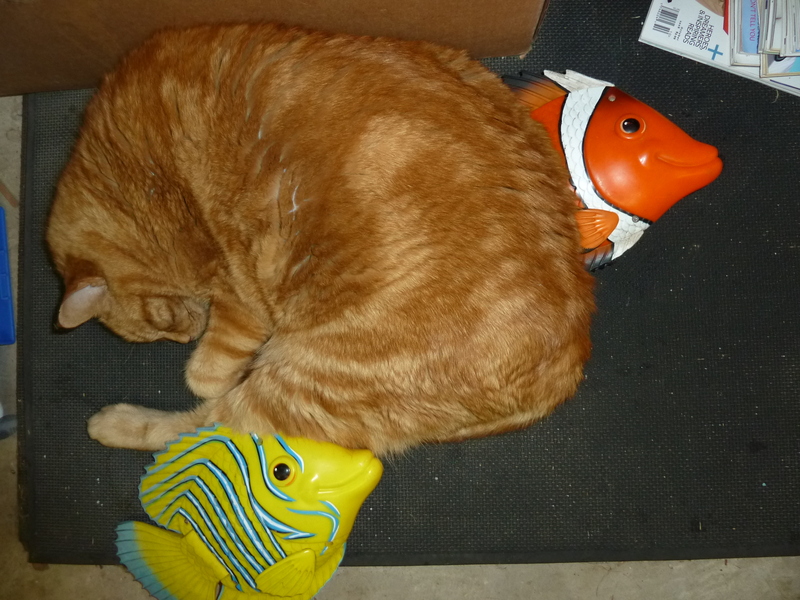 About a year ago I went out into the garage for something and saw Kivuli’s fish laying on the floor. I briefly wondered how they got there, but didn’t put a lot of thought into it. I just left them there and went on my way. A few days later I saw them again and I realized quite suddenly that they had been on the shelf, just a few feet off the ground, and that Kivuli had pulled them down. There really was no other explanation. I also realized that they were laying on the ground right where he sleeps at times. He likes spending time in the garage, his car is out there too…yes, he has his own car (another story for another day). He is one special boy. This entry was posted in Cats, Kivuli. Bookmark the permalink. Awww, he missed his fish. How cute. Ya – It was pretty cute. It made us giggle to see him with his fish again. Your cat is so cute! I love all the different personalities cats display.